Not just a mantra for the 21st century; it’s the current political climate. Now more than ever, Americans are looking to create jobs for hard-working people who are dedicated to making products that are carved from American made materials and fabricated by legal Americans right here in the U.S.A. Since 1974, Boat Floater Industries, LLC has proudly designed, engineered, manufactured, and assembled quality boat lifts that have been sold and installed on lakes and rivers across the United States. We take great pride in creating the ultimate boat lift that creates jobs in America for Americans. 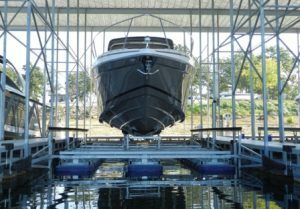 Furthermore, boat lifts that endure decades of use and provide protection and security for boats owned and operated by people just like you! You’ll discover working with Boat Floater Industries, LLC is a positive experience. Whether you’re the end user (boat owner) or the dealer or distributor that sold the lift, your experience will be flawless from beginning to end. We want nothing but the very best for our dealers and end users. It all starts with a manufacturing process that includes individual components that are manufactured right here in the U.S., of the highest quality material and craftsmanship. Once the individual parts have been manufactured to our highest specifications, our team of highly-qualified specialists assembles each and every part with care, right here in the U.S. Nothing passes Go or collects $200. It simply has to meet our standards or it doesn’t ship. We strive to have a life-long relationship with everyone we do business with.